80% of consumers use search engines (in layman’s terms: Google) to find local information for services near them. That’s important for restaurants—what it means is 4 out of 5 potential guests are using a search engine to figure out where they should eat. So it’s important that people are able to find you online. It might seem like a simple solution: have a website. But, unfortunately, it’s not that easy. You need to be smart about your restaurant’s web presence because there’s more competition now than ever before to show up at the top of search engine results. Which brings us to search engine optimization (aka SEO), which we’ve previously discussed as how Google and other search engines find your site. It’s important that your website is optimized for SEO, so that it shows up quickly when people search for it. We mention SEO pretty often in our blog posts, so we’ve rounded up our top 5 SEO tips for restaurants to reach more guests, all in one convenient post. Web design can be tricky, but it’s really important to make sure search engines can “crawl” (or in other words, read and find) your website. For example, Google can’t read certain things, like when all the content is Flash, or all the important text is on an image (like a PDF menu). Google will ‘read’ an image as an image, and won’t be able to read any of the text within. Fortunately, every BentoBox website has SEO tools built right in, to ensure that your website is crawl-worthy, with no coding necessary. More than 50% of people visiting BentoBox websites are on a mobile device, which means if your restaurant’s website isn’t mobile friendly, you could be missing out on new guests. On top of that, Google’s search algorithm update last year actually penalizes websites that aren’t mobile-friendly by ranking them way lower on search results. Mobile search is super competitive because there’s a lot of scrolling for results, and people get bored. Test your restaurant’s website with Google’s Mobile-Friendly Testing Tool, and remember that you can always ask us for any help with mobile formatting. Many guests will search for a menu before making a reservation, so it’s important for your menu’s keywords to rank highly on search results. Having a separate page on your website dedicated to your menu will help increase search rankings, but only if the menu is in the right format, to allow Google to read it. The best way to ensure search engines can find and read your menu is to write it in plain HTML code, not upload it as a PDF. As an additional bonus, HTML menus are much easier for guests to read since they don’t have to download anything or try to zoom in if they’re on a mobile device. 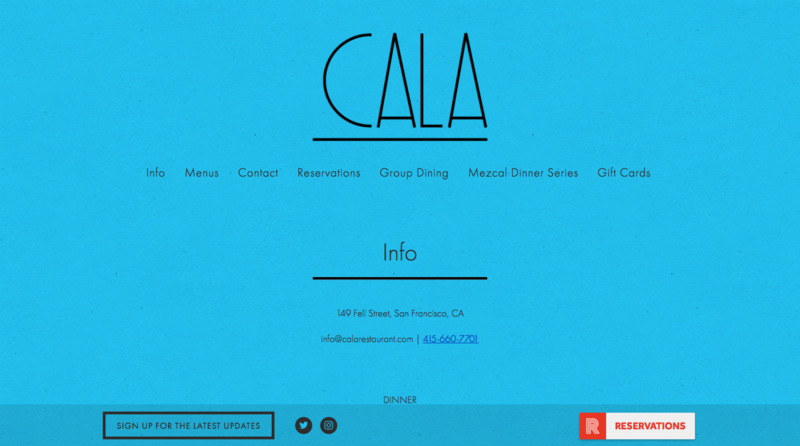 Cala's naviagtion bar neatly shows where to find info, reservations, and menus. Our data shows that location, menus, reservations, and online ordering make up 60% of the clicks on a restaurant website, which means those are the things guests are searching for. Having separate pages for reservations, menus, online ordering and locations each helps generate organic sitelinks (aka the other links that show up underneath your first SEO result when guests search your restaurant’s name)...which means that more links associated to your restaurant will show up when people search for your restaurant. Loring Place's BentoBox press page. When it comes to Google “reading” your website, it will take into account how reliable your website is based off of backlinks. The higher in reliability your website scores, the higher in SEO it will rank. We won’t get into all the nitty gritty of backlinks, but what you should know is that these are links that can help boost (or hinder) the reliability score Google gives your website. Imagine backlinks as “endorsements” from one website to another. Ever notice how an online food magazine will link to a restaurant’s website when it mentions that restaurant in the article? They’re not only trying to help their readers, they’re also trying to boost their reliability score (and in doing so, improve the restaurant’s reliability score, too). 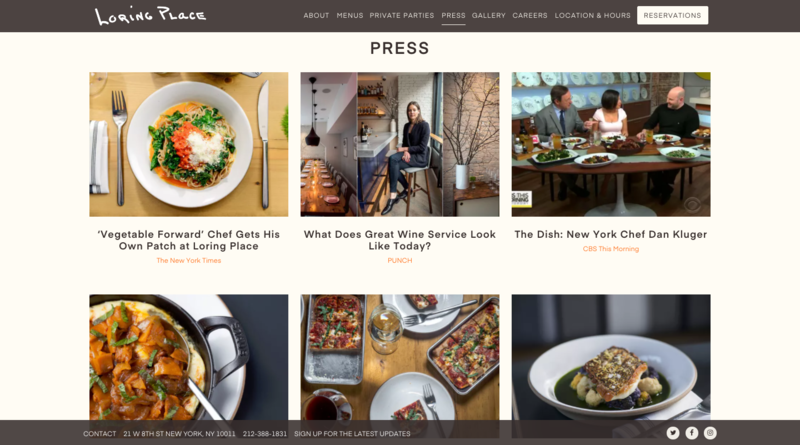 This relationship works both ways, so it’s important to add press hits to your restaurant’s website! With BentoBox’s press page, you can easily add articles from sources, showcase all the nice things writers say about you, and properly cite the credible source at the same time. It’s a win-win all-around.